I was very pleased last week to be contacted by The Works, to ask if I wanted to take part in their 2 gifts for £10 review. I was very happy to oblige as I love The Works, it’s my go to shop for school birthday party gifts, and christmas stocking fillers. I nominated Jacob, Thomas’ friend in school, and my grandad to receive presents, and sent a bit of information about their likes and hobbies. The elves from Santas Workshop at The Works then went to work, scouring the shelves for the best gifts in the deal that they all would love. I was so so happy when our parcel of surprise presents arrived, and amazed with the quality of the gifts which were all 2 for £10, and also in awe of The Works Elves amazing gift picking skills. For my grandad I mentioned that he likes to read a good book, but about things like nature rather than fiction. 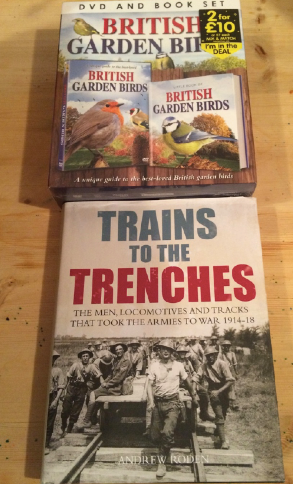 He will be thrilled with his brilliant value book and dvd set about birds, and a book about trains used during the war. Next was Thomas’ school friend Gemma. She 10, and into arts, crafts, fairies and everything glittery. 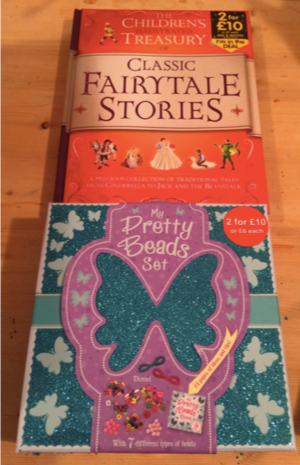 The gift of a beautiful glittery box of beads, and a fairytale story book couldn’t be more suited to her. She’s going to be thrilled with those. And finally Jacob, who I said was 7 (nearly 8 as he will hasten to add) and loves arts and crafts, and building things. 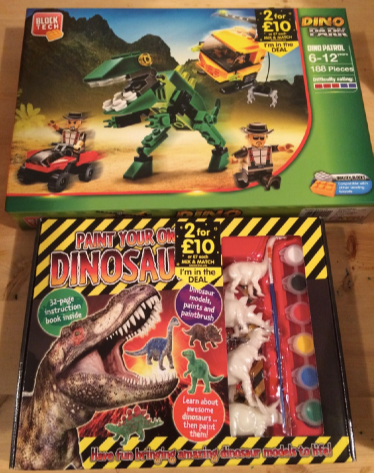 He’s going to be over the moon with his Paint your own dinosaur set and Dino Park Bulding Lego style block set. He was absolutely crazy about Jurassic World this summer, so these will go down really well. Even though I’m used to The Works great value, i’m really quite surprised how many cool, interesting, and fun things that you can pick up at an incredible 2 for £10. 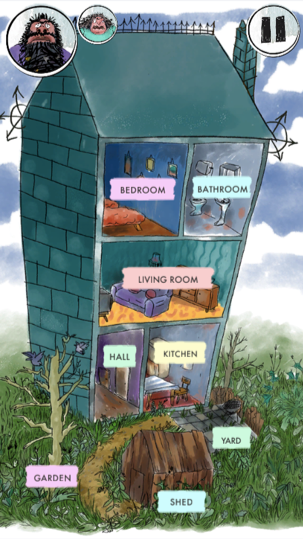 Just take a look at the The Works website for yourself, and along with the above theres Magic sets, cookery books, Jewellery sets, books about space, and so much more. As you must know by now, my boys absolutely love LEGO. Well we all do. So when we were asked to review the new LEGO Awesome Ideas book from DK Books, we couldn’t say yes quick enough. 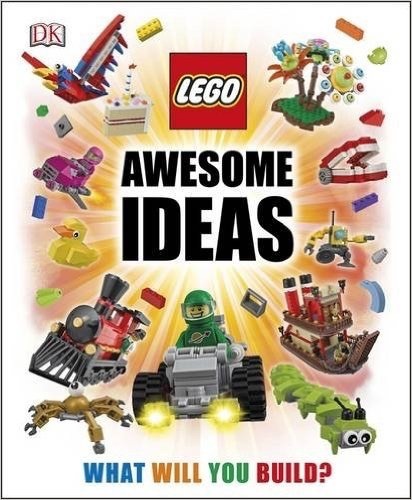 The LEGO Awesome Ideas book is a brilliant book packed full of so many crazy, exciting, imaginative ideas for things you could build with the LEGO you already have. Most of the big ideas show you exactly what pieces you would need, and which sets those pieces could be found in. Theres also suggestions for alternative pieces you could use, if you didn’t have some of the very set specific pieces on hand. The variety of things included astounded me. Yes theres the obvious houses, space ships, cars and trains. Theres also crazy things that I would have never though were so easy to make like a box of LEGO chocolates, Bunsen Burner and Test tubes, and a bathroom shaving mirror. 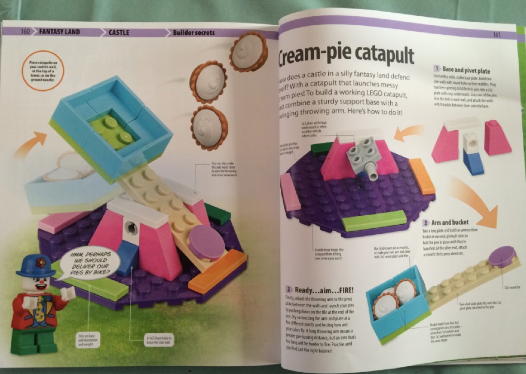 After reading through the book for over an hour, the first thing Jacob decided to try his hand at was the Cream-Pie Catapult. We have lots of Creme-Pies from His favourite Joker and Krusty the clown mini-figures, so we started off with that. I would definitely recommend this book for Lego fans. I think fans from around aged 8 and over would get the most from this book, as it’s not a step by step guide just a jumping off point into Lego Building. Possibly younger fans would get a bit frustrated, as some of the designs can get very intricate and detailed. However even if your in the mood for building some LEGO, if your a fan it’s simply a great book to sit back and enjoy. The Designs are amazing, the ideas are brilliant, and I just love the whole look of the book. I think as my children get older it’s a book that’s going to be used more and more. ©2015 The LEGO Group. Produced by Dorling Kindersley under licence from the LEGO Group. Disclosure: We received this book from the Publishers in order to write a review. All opinions are our own. 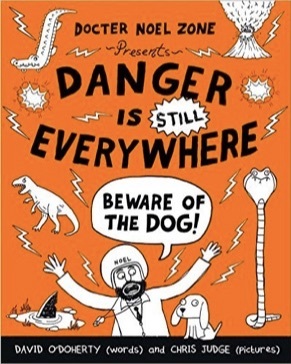 Danger is everywhere was one of the Toybuzz boys favourite books we picked up last year. So we were thrilled to be sent the follow up “Danger is still everywhere” to review. It’s hasn’t got a story in the conventional sense, It’s more of a series of life tips for achieving Dangerology Level 2. However there is a running theme throughout, Doctor Noel stuck in a wardrobe hiding from a dog called Napkin. As well as the crazy and wacky writing, the illustrations are hilarious. Jacob is always running over to show me what he thinks are the funniest pictures. knights fighting with cucumbers, guy in a fly costume being chased by spiders, Hippo being used as a picnic table, All these crazy scenes are beautifully illustrated in this book. Danger is everywhere is such a funny book, and my sons laughed so hard reading it. They have both read it twice already. A Toybuzz family must read book! We’ve received lots of books recently, not that were complaining. So it’s another book review today. 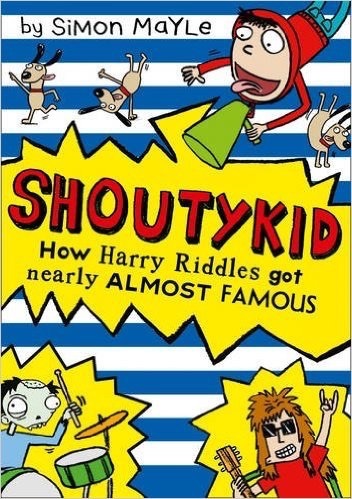 Shouty Kid:How Harry Riddles got nearly almost famous is the third instalment in the Shouty Kid series. My boys have both read Shouty Kid book 1, and they both really enjoyed this new book as it’s more of the same basically. 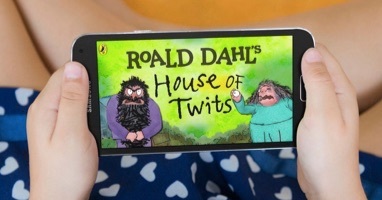 Author Simon Mayle has come up with such a clever writing style for the Shouty Kid books. Rather than have a written story, like Diary of a Wimpy Kid the story is told in a series of daily entries. However Shouty Kid is very much a book for the younger generation of today. Diary entries are replaced by Emails, Text messages complete with Emojis and Forum posts. It is a brilliant way to connect with young readers, as it’s so true to life. As if they are anything like my oldest son his social life is conducted totally over Xbox messages with people with silly usernames just like Harry. 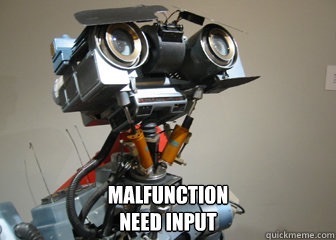 I’m sure that’s definitely why my sons have had such an instant connection with ShoutyKid. Neither of them wanted to put the book down when they’d started. Jacob got very impatient, as he had to wait for big brother to finish until he could read it. The book follows Harry and his quest to win a Battle of the Bands competition at school. In-between theres Dad’s plans to take the whole family sailing around the world for 2 years. How can Harry become a star if he’s stuck on a boat in the ocean? As with the first book my favourite part is reading the various emails and letters that Harry sends to random celebrities. Bob Geldof, Ozzy Osbourne, Vladimir Putin, He even writes to Mick Fleetwood! I love that some of the email and postal addresses for these celebrities are genuine. It adds a sense of credibility to the letters. Anyway I digress. Being into his books he was really pleased to receive a new book to review last week from Harper Collins. 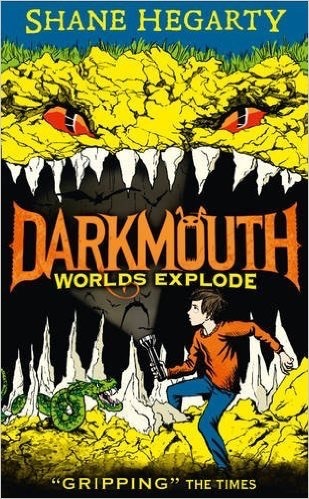 It was The second book in the Dartmouth Series, Dartmouth – Worlds Explode by Shane Hegarty. He hadn’t read the first book, but theres a short round up of what’s happened so far at the start of the book, so we knew what was going on. It’s all about a twelve year old boy called Finn, who’s a trainee Legend Hunter. Legends are dark mysterious monsters who live in The Infested Side. In the last book Finn’s dad who is the only proper Legend Hunter left in Dartmouth got trapped in The Infested Side, and Worlds Explode sees Finn trying to get him back. Thomas very much liked the character of Finn. It’s one that most pre-teens can identify with I think (minus the monster hunting of course) Finn’s a bit awkward, often messing things up, everyone thinks he’s not really up to the job as he’s not old enough yet and doesn’t have the experience. He doesn’t even really want to be special and hunt monsters, he’s just following his dad into it. However he goes off on an adventure and works hard to put things right by getting his dad back, and shows everyone he’s a worthy legend-hunter. The book is full of wonderful illustrations, maps of the worlds, pictures of the legends. We particularly love one picture which shows the scale of what Finn is up against whilst fighting in a massive battle between the half-hunters and the Legends. It really gives you an insight into the story, and helps put you smack bang in Finn’s place. Thomas is also a big fan of the Percy Jackson series, and he says that he can see Dartmouth becoming another one of those great series of books. The ending definitely leaves you wanting more, and is incredibly creepy. Not scary, but creepy when you think about what happens. It’s very visual, and Thomas came down straight after finishing and told me to read the last pages as it was so good.